Accountability. On its surface, the word simply means a willingness to accept responsibility for one’s actions. Accountability as applied to schools, however, has become so twisted and polarizing that it is now the equivalent of a dirty word. To mention it is to risk being met with stern, disapproving looks and accusations of being anti-teacher and a corporate raider looking to profit off the backs of kids. What? How did we get here? As with all polarizing issues, the truth is much more nuanced and requires us to look beyond the sound bites. The “A” Word seeks to do that through conversations with recognized education leaders. It is worth remembering that the origins of school accountability are found in the 1964 Civil Rights Act. The landmark legislation prompted American leaders to examine how schools across the country could move beyond the separate-but-equal educational approach that Brown v. Board of Education had rightly condemned a decade before. As long ago as Abraham Lincoln, American leaders had warned that the nation could not progress if the United States remained a house divided. After Congress passed the historic law, educating all of America’s children well gained momentum as a moral imperative. A fledgling education movement emerged in the 1960s to confront the largely racial divisions that existed across the country. The reformers insisted upon raising academic standards for all students and ensuring that students of all backgrounds meet them. Not only was this new path seen as moral and right, it was understood as a necessity for an economy that, post-Sputnik, was taking on a sophisticated technological dimension. The accountability movement soon spawned the National Assessment of Education Progress, with the first exams being taken in 1969. Known as the Nation’s Report Card, NAEP would help the nation answer Sen. Kennedy’s question and compare the success of students across communities and states. Some community leaders and elected officials understood that measuring the academic progress of all students would help ensure that poor or minority students were not bypassed. Efforts to desegregate schools picked up momentum. In the 1980s, the nation became more aware that academic standards must improve for the U.S. to maintain its advantage in an economy increasingly driven by technologies. Some states responded in the 1990s with independent exams to focus more on the “outputs” of schools, such as student achievement rates, not solely on the “inputs,” such as school spending. But not all states used a common, comparable assessment. That meant no “apples to apples” comparison of student progress across district or state lines for parents and stakeholders. Districts and states were also not required to report student performance by such categories as race, ethnicity, and income, known today as sub-group student data. Instead, averages were commonly accepted, masking the gaps in performance — and supports — for students who were black, Latino, or poor, as well as students who were challenged by learning disabilities or who were English language learners. The smooth edges of averages made two assumptions palatable: First, most of our schools were doing just fine; and second, some students were just not able to achieve at high levels. In 2001, President George W. Bush led a bipartisan group of policymakers, including Sen. Edward Kennedy, to address this phenomenon, what he termed the “soft bigotry of low expectations.” The bipartisan leaders understood that schools and students would benefit from independent exams being given annually in key subjects like reading and math. They also believed that holding schools and districts responsible for the results would lead to progress for every student, regardless of their personal circumstances. Their shared commitment led to the creation of No Child Left Behind in 2002. The law required states to determine whether their students were meeting state academic standards and held schools accountable for the results. NCLB ensured the results were transparent so parents, schools, and taxpayers could see how well each group of students performed in a district and on a campus. This focus on student subgroup data was powerful. Not so long ago, some students were intentionally excluded from measurement; for example, Dallas only started giving the Iowa Test of Basic Skills to minority students in the early 1970s. Throughout the 2000s, scores on NAEP exams rose for many students, including poor and minority youth. 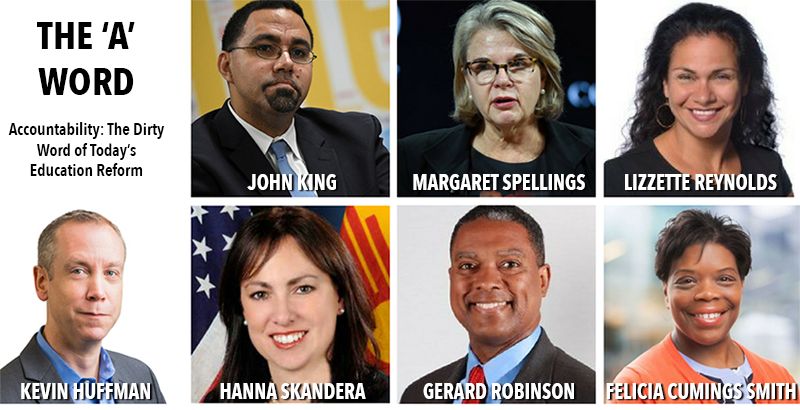 The progress built upon the success of the accountability systems that states created both before and after NCLB. In granting waivers from NCLB’s requirements, the Obama administration further pushed a federal agenda that included Common Core standards and more reliable teacher evaluations. The Every Student Succeeds Act now places the responsibility back on the states to meaningfully measure the progress of all students. The law, which Congress passed in 2015, forces states to articulate what matters to them, how they will measure it, and how they will support schools falling short. Over time, though, a resistance to accountability has emerged. Opponents question the emphasis on raising academic standards, independently assessing students against those high standards, and holding educators responsible for the results. The gaps in student achievement across various groups of students were plainly revealed through accountability systems. Yet not enough research-based, proven interventions were available to educators who were trying to change policy and practice in order to better serve students. At the same time, knowledge of how to implement and sustain interventions in complex school environments was lacking. Political will began to wane and resistance grew. The pushback intensified as the performance of some districts and schools on independent state exams did not track the self-congratulatory tone of local districts and their leaders. It is difficult to claim that all of a district’s students are successful and that all of its educators are exemplary if student achievement data tell a more sobering story. In short, accountability started to pinch. The interests of adults in the system and children in the system — sadly and strangely — became at odds. Today, voices resisting the push for accountability have become louder and more powerful. Frequently, messages resisting or disparaging testing, standards, teacher evaluations, and school and district report cards are found in op-eds, sound bites, and school board meetings. This swing in sentiment is not a total surprise; the work of educating children is complex, as many talented educators working hard each day on behalf of their students can attest. This complexity is magnified for our most vulnerable students. That complexity, however, does not justify a retreat. Implementing meaningful accountability systems requires thoughtful and diligent persistence — and it requires challenging long-held assumptions, practices, and power structures. 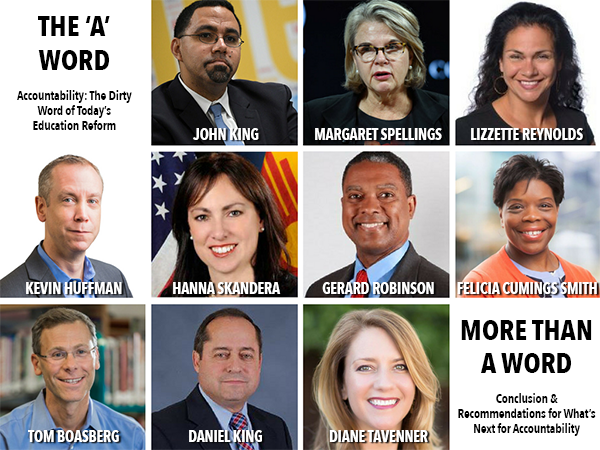 What is missing from today’s debate are the voices of the many education leaders who have embraced accountability as a way to change outcomes for the students and families they serve. These leaders actively seek and use reliable data to measure progress and to determine which research-based interventions are likely to increase student success. They operate transparently in drawing public attention to the challenges schools face and the achievements they make. They openly address the complexity of getting accountability systems right while maintaining their focus on measuring the progress of all students. Perhaps not surprisingly, these leaders face opposition. Yet they persist in “doing” the work of accountability each day and are learning along the way; it is their perspective that needs amplification in policy discussions. – Diane Tavenner, the founder of the Summit charter school network. As you read these conversations, which we conducted this year, you will find a strong explanation for why accountability practices matter and an honest analysis of how states, school districts, and local campuses can improve those practices. Accountability is not a static concept; it is a dynamic one that should be modernized and strengthened for the benefit of America’s students. The interviews were conducted over the telephone, transcribed, and edited for clarity and length. The same questions, or types of questions, were put to each participant to see what they thought independently and collectively about accountability. Their answers will take the reader into the inner workings of schools, the intricacies of the politics of education, and the ways in which campuses can better serve students.